Almost ready to order a mat but would like to hear some feedback from anyone who might own one or the other (or both). What I like about Hotz is I can get a double sided mat something I don't think Cigar Box offers? Cigar Box has double-sided mats. Check their site. Holtz has a reputation for slow delivery, but the products are good. Yes have the European field mat from Hotz, I like it. Didn't see where Cigar Box does double sided. Emailed them. Cigar Box did a big Kickstarter last fall for double sided mats, but not sure they have them for sale or will anytime soon. They are fantastic, though. Yup. Double-sided mats were available in the KS. I own both brands of mat. I am a huge fan of the Cigar Box mats, especially their plush mats. I own mats from both. Hotz are felt and are a little heavier/stiffer than Cigar Box, which are made from a thinner fabric. I find it easier to create contours and hills with Cigar Box mats. I have some Cigar Box mats and for some reason I can't get a decent photograph of my games using those mats. I have tried everything that has been suggested to me and they still wash out in my photos. I am very much in the minority but I don't like Cigar Mats and several other of the new style photo mats. I find they do not work well with 15mm or smaller scales. They are too garish for my taste. I have stuck with my felt mats. I can add flocking and ground cover to them and they, in my opinion look much better than the new style mats. I have never tried a Holtz mat because of all the issues reported by their customers. Some never getting their order or if they do it takes months. I get my mats from Monday Knight and they work well. I can make them look great. For sure it's something for me to consider, but I want to stay away from flocking anything. I tried making terrain once and just didn't enjoy the process nor the time it took to setup and take down the battlefield. 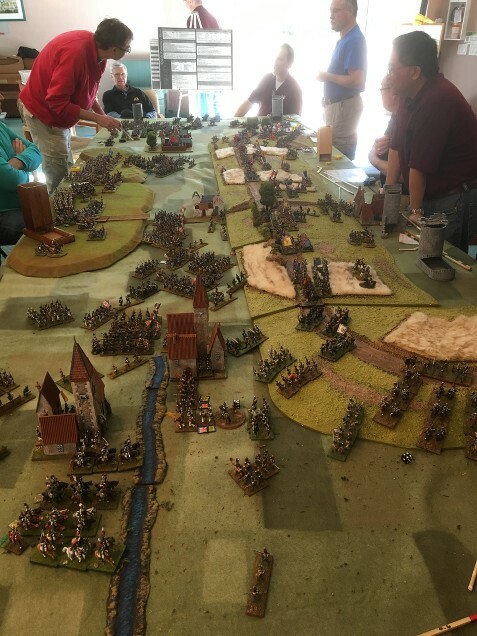 Here is a photo of a Hotz European field mat during a Burgundian game. I love cigar box battlemats. Best scenery / table product I have bought in awhile. Can't say enough good things about them. They are two very different products. Hotz are thick felt mats which lay flat on the table with airbrushed style decorations. really designed for putting terrain on top of it as seen above or playing on a nice grid. I have many of these and very happy with them. If you want a throw it down and play felt mat they work great. If you want your email about buying a mat to never get answered, go with Hotz. Considering Hotz's customer service reputation, I think you made a wise choice. I've ordered a couple of times from Hotz (albeit about ten years ago) and had absolutely no trouble at all. And the mats are all just as good as new! Even my copious tears from my many,many defeats have not stained them at all! More seriously, if you get the Hotz "accessories" like the roads, or streams or fields, they are made of the same felt, and for some reason they really stick well to the felt mats they are placed on. They certainly won't be bumped or moved accidentally during play. 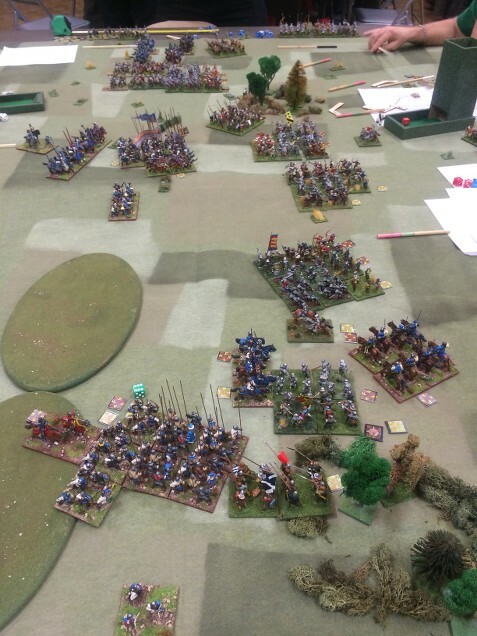 That said, some of our wargaming group have Cigar Box mats, and they are also rather nice. I personally don't like the CB mats that have pre-printed roads, woods and other terrain features permanently printed on the mat, but the other more generic ones look pretty good.